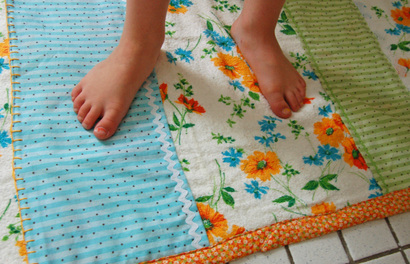 It occured to me last week that I could solve my never-ending quest for perfectly sized, affordable, washable, and fun rugs by...making my own, of course! And so was the mission this weekend, using a thrifted towel for the backing, some thrifted terry for the front, and some cotton for the panels and binding (with ric rack, lace, and blanket stitch for 'embelishment'). I've been loving this vintage terry since I found it thrifting this spring, but couldn't come up with the right project for it until the rugs came to mind. 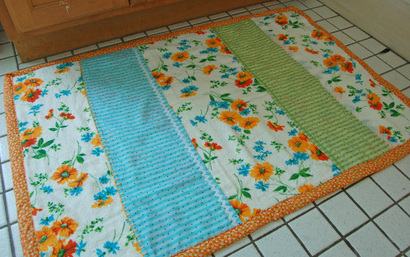 I need to make one more for the bathroom, and I'll still have 4 yards left of the terry. I was thinking of using it to make a new shower curtain, since I'm all about the over-the-top matching thing. Why not. And then...the rug-making is moving onto the kitchen. So fun, I tell you. Rugs! Who knew? !